I had a great weekend last weekend! Darcy and I headed out to a party all by ourselves, which was a first. We were lucky enough to attend the second Sacramento Food Bloggers Potluck. As a result, I updated by blog roll to include all the new blogs I discovered while chatting with people at the event. (Actually, I pretty much stole Garrett's, since he is our Social Chair.) A highlight in my book was Garrett's Chipotle Flourless Chocolate Cake and you can find the recipe over on Simply Recipes. Just like at our last potluck, there was a tremendous amount of outstanding food! Everyone gets more and more creative - I am always impressed by the talent shown by bloggers! I used Darcy as an excuse and brought Garlic and Herb Spread. If you haven't tried it yet, make it this weekend! Nellbe at Nellbe's Scribblings informs us of Rachael's impending trip down under. Kalyn of Kalyn's Kitchen tried one of my favorites - Hot and Cold Sesame Noodles. Andie at Sweet. Southern. Spirited. tried out Rachael's recipes for Sorta-Soba Noodle Bowls and Szechuan Chicken Salad. 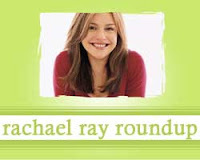 According to MediaLife, Rachael Ray's magazine is going against the trend and is increasing its ad pages. David T. at Tixxie tells us about Rachael's appearance on Million Dollar Password. Paige Turner of Book Bandit on the Run gave Rachael Ray's Chicken, Plum and Red Onion Kebabs from Every Day with Rachael Ray. Kellie at Busy Mamas tried Crunchy Parmesan Chicken. Kristin's Nibbles features a review of That's Shallotta Flavor Spaghetti.